The following texts by fellow artists, travellers to Rome, patrons, historiographers and others provide a glimpse of the reception of Angelica Kauffman’s life and work. 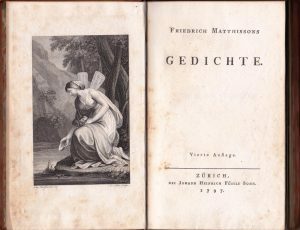 The more Angelica Kauffman came into the public limelight, the more the misjudgements and preconceptions about her as a person, and about her work, were reinforced. Over time, both the acclamations and the vilifications became ever more trivial and hackneyed. What is more, there is also a range of typifications in which not only stereotypical images of femininity but also Christological arguments and theories of genius play a role. To this day, both the contemporary as well as the posthumous assessments of Kauffman and her art differ from those of her male colleagues in that they take clichés about femininity as their point of departure and are overshadowed by the gender question. In the process, her work is rarely taken seriously as the result of a deliberate and well-considered artistic concept. “[…] Du betratst diesen Tempel der weiblichen Kunst und sittlichen Grazie in derselben mit Ehrfurcht; und mit welcher Liebe empfing Dich Angelica!